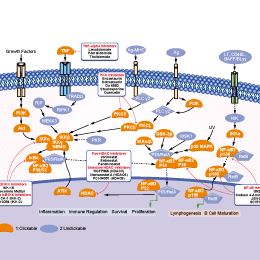 Omaveloxolone (RTA-408) is a synthetic triterpenoid that activates the cytoprotective transcription factor Nrf2 and inhibits NF-κB signaling. Phase 2. Ammonium pyrrolidine dithiocarbamate (PDTC) is a potent nuclear factor-κB (NF-κB) inhibitor that inhibits IκB phosphorylation, blocks NF-κB translocation to the nucleus and reduces the expression of downstream cytokines. Evodiamine (Isoevodiamine), an alkaloid extract from the fruit of Evodiae Fructus exhibits antitumor activities against the human tumor cells. It is shown to inhibit NF-kB activation through suppression of IkB kinase activity. Indole-3-carbinol is produced by the breakdown of the glucosinolate glucobrassicin, which can be found at relatively high levels in cruciferous vegetables. Indole-3-carbinol suppresses NF-κB and IκBα kinase activation. Magnolol is a bioactive lignin found in the bark of the Houpu magnolia (Magnolia officinalis) which shows antifungal properties. It can block TNF-α-induced NF-KB activation. Triptolide is a diterpene triepoxide, immunosuppresive agent extracted from the Chinese herb Tripterygium wilfordii. It functions as a NF-κB inhibitor with dual actions by disruption of p65/CBP interaction and by reduction of p65 protein.